The video wasn’t embeddable, but fun scene. Watch it! CLICK ABOVE. It’s November. I don’t know exactly why I tend to so expressly observe times and seasons and months like I do. I just need to understand the time I am in…what is it for? They taught us that in elementary school: in September it is yellow school busses and rain galoshes and sharpened yellow pencils and cursive handwriting practice. Then came the jack-o-lanterns of October, coloring spooky houses and friendly ghosts on math worksheets. “Over the river and through the wood to grandmother’s house we go,” got trotted out each November in music class. I couldn’t have dreamed I’d ever be a grandmother and to this day I trace my grandchildren’s hands and make “turkeys” just the way I learned to do it in Kindergarten a hundred years ago. November was thankfulness and cornucopias and the browns and oranges and deep golds of crispy leaves blowing along the curb while we walked to school. I like to mark the times, the days, the seasons and this IS a month for gratefulness. So many things should be marked with an official “thank-you,” and sometimes in the hurried months we forget. 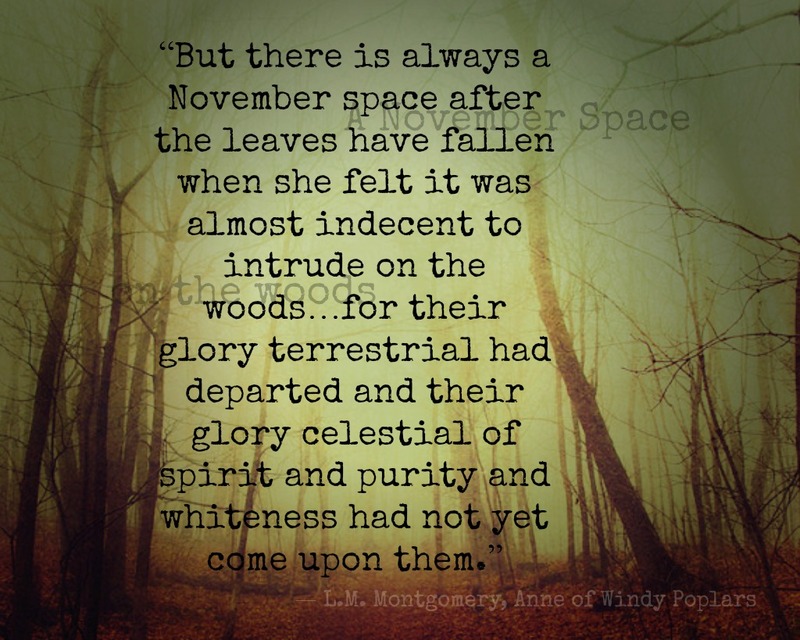 So November comes and reminds me. That is what this time is for. O God, you have been good. You have been faithful to all generations. It’s topaz and crisp mornings and where did all these falling leaves come from? It’s pumpkin-everything and Thanksgiving time and ok to start watching Christmas movies now. It’s All-Saints-Day (count me in!) and sweaters and scarves and good friends and coffee and building altars of remembrance. It’s a good time to rest and enjoy from the abundance of the storehouses the blessings of God on the year. Happy November, one and all. Be sure to leave some space in your November…and be filled with thanksgiving. This is the time for it.